There’s a famous concert places here in Mexico City called Auditorio Nacional, where bands and artists from the whole globe have come to play. Now, since a couple of weeks ago, the auditorium was also used to watch music DVDs in a giant screen, so imagine being in a place where 12k people can enter and watch a concert from a legendary band, with only fans, a great sound and a cool vision, some melancholy and excitement is the result. So last Wednesday was programmed to the “Live at the Bowl 68’” concert by The Doors, a very popular band here in Mexico, a band I actually love. So I went with my friends and found that there were a lot of people, a nice combination of old and young fans who wanted to sing their favorite Doors tunes. But well, I am not reviewing the experience, but the DVD, so let’s start. 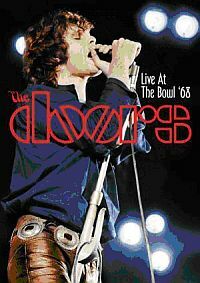 The DVD represents one of the most memorable Doors concerts ever, at the Hollywood Bowl in 1968, sharing stage with Steppenwolf and another band whose name I don’t remember now. In the special features of the DVD there are interviews with the three members of The Doors who are still alive, with Bruce Botnick (producer), and some other people who lived that show and share their memories. So with it we can have a background of the show, what happened before, some memories of the band and feelings at that moment, they actually narrate it as if they were living it, since that show was a special night for them, they can remember it very well. This descriptive part of the DVD is cool, nice addition. Now the concert per se, it was a great one, with “When the Music’s Over” as the opener track, ironically selected to say that it is not over, it is only beginning. What I love from their concerts is that they improvise in almost all the songs, they are not truly a jam band, but in they are capable to become one when it is necessary. I mention it because since this first song we can appreciate they improvised in some moments, showing their connection as a band. Densmore seems not to be that crucial, but actually we can see his drums have the power to take decisions, he marks the rhythm and he says when to stop the jam and return to the original song. Manzarek always is a king, though he only plays keyboards we all know he also plays bass symbolically talking; Krieger is not that fine at the beginning, but he knows how to recover and make the crowd rock; and Morrison was unique, under drugs or clean, he was one of a kind. Then the concert continued with a lot of classic songs, most of them are short tracks that live were combined with some of Jim’s poetry, which at the same time was combined with musical improvisation and vivid emotions between band and audience. The following was a three-song chapter with “Alabama Song” – “Back Door Man” – “Five to One” combo that finished with a reprise of Back Door Man, it was really cool, none of those tracks were played completely as in the original albums, but as a kind of medley, which normally would be improvised, but for this concert they confessed they did rehearse. Some other songs performed were “Moonlight Drive”, “Spanish Caravan” or “Hello, I Love You”, before the band decided to play “Light my Fire”, which is probably the one that excited the audience the most, we can see it on the movie, people were screaming like crazy, while The Doors took over the stage and the night, it was theirs. With “The Unknown Soldier” we can see how they also were like actors, Krieger took the guitar and shot Jim, who fell down symbolically dead. The final song was “The End” with a memorable passage where Jim smiles before saying terrible words to his mother. What a way to finish a concert. This DVD is excellent, a must have for Doors fan and a excellent addition to anyone’s collection, it was a cool decision to record it almost 50 years ago, and to release it at last.